The professional cleaning teams at Green Apple know the best ways to maintain a clean house or work space. 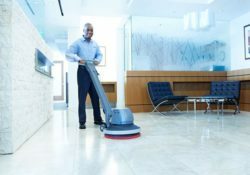 Between regularly scheduled cleanings for entry ways, rooms, work areas, cubicles, kitchens and bathrooms, there are things that customers can do to maintain a clean home and sanitary work location. Frequent cleaning makes cleaning much easier. Don’t let cleaning floors turn into a project. Try turning on some music before you start! When mopping, start at the furthest corner of the room and then move back towards the entrance. If you have a glossy surface on your floor, use a clean cloth wrapped around the end of the squeezed-out mop to avoid streaks. Damp mop only after loose dirt and debris has been thoroughly removed with a broom, vacuum, or dust mop. 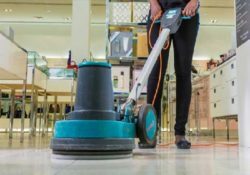 Use a combination of warm water and all-purpose cleaner to mop ceramic tile and vinyl floors effectively. Keep a small vacuum near the bathroom and give the floor and any carpets a quick once over every day. Use a small squeegee after your morning shower to slow the development of water marks. A simple nylon netting over the drain in the shower or tub can significantly reduce hair clogs. Keep some potpourri, or a fresh candle, in the bathroom for a good scent. Before you begin deep cleaning your kitchen, take the proper steps to prepare. Dust all the areas of the kitchen to prepare the surfaces for your work. Then fill up the sink with a cleaning solution mixture so that you can easily soak your cloth often throughout the process. Start cleaning one side of your kitchen, wiping every surface in small sections top to bottom all the way around the room. Save your microwave and stove for last since they are the greasiest. Save the sink for last since it holds the cleaning solution and end it with a sparkling shine. One quick tip for a stubborn microwave is to place a cup of water in the machine and boil it for a few minutes. This loosens up debris and grime in the microwave for easy cleaning. After you’ve scrubbed the microwave and stove clean, drain your sink, spray in some all-purpose cleaner and use a brush to thoroughly remove any trace of your cleaning solution. Finish cleaning your kitchen by sweeping or vacuuming the floor, then mop it. For a Green Apple commercial cleaning or residential cleaning estimate for your home, office or work location in Maryland or Washington, DC call us at 410-631-7070.